Gold Coin – is a smooth, shimmering light gold that applies like a dream. Two coats and it was smooth and opaque. 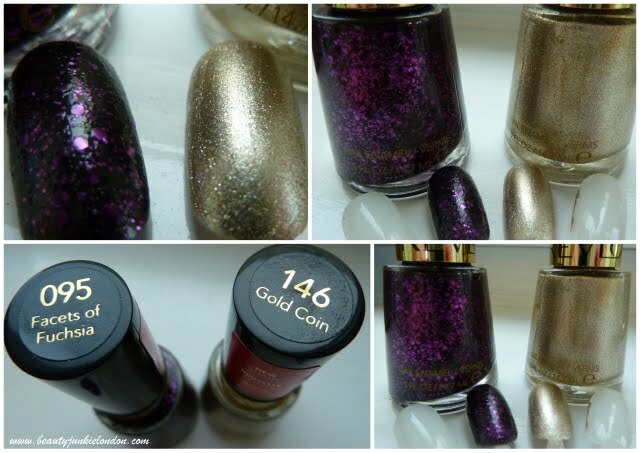 I love the idea of gold nails with a purple ‘accent’ nail…. Facets of Fuchsia – something a bit different from Revlon, it has ‘flakie’ bits of purple glitter rather than little chunks there are pieces of glitter in lots of different sizes. This took about 2-3 coats to get the black base looking suitably thick. The purple glitter flakes do mean the finish isn’t perfectly smooth and could definitely benefit from a top coat to smooth it over. I need the polishes! Perfect for Xmas! Eyeliner is an amazing colour 🙂 love!! !